Self-determination by any means necessary. The sentiment is by Malcolm X, whose incongruous beginnings were in this conservative, white-bread city. Not where you’d expect a revolutionary to originate. Then again, his narrative would be incomplete if he didn’t come from oppression. Born Malcolm Little, his family escaped persecution here when he was a child. His incendiary intellect and enlightenment were forged on a transformative path from hustler to Muslim to militant to husband, father and humanist black power leader. As it does annually, the Omaha-based Malcolm X Memorial Foundation commemorates his birthday May 17-19. Thursday features a special Verbal Gumbo spoken word open mic at 7 p.m. hosted by Felicia Webster and Michelle Troxclair at the House of Loom. Things then move to the Malcolm X Center and birthsite. Friday presents by the acclaimed spoken word artist and author Basheer Jones, plus The Wordsmiths, at 7 p.m.
On Saturday the African Renaissance Festival unfolds noon to 5 p.m. with drummers, native attire, storytelling, face painting and Malcolm X reflections. Artifacts from the recently discovered Malcolm “Shorty” Jarvis collection of Malcolm X materials will be displayed. The late musician was a friend and criminal partner of Malcolm Little’s before the latter’s incarceration and conversion to Islam. It’s a full weekend but hardly the kind of community-wide celebration, much less holiday, devoted to Martin Luther King Jr.
“I tell people, you may still not like Malcolm X, you may have a problem with a revolutionary. Martin was a revolutionary and maybe you came to love him. 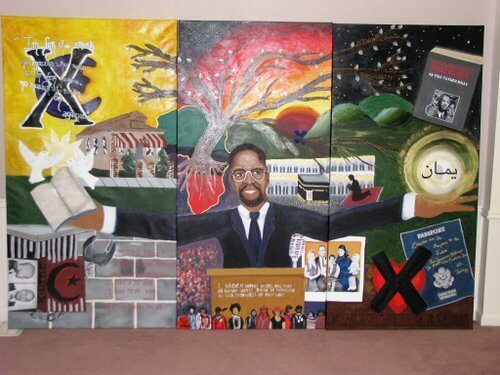 But I do want you to know brother Malcolm’s whole story and where he came from,” says MXMF president Sharif Liwaru. Using the tenets of Malcolm X, the foundation promotes civic engagement as a means foster social justice. Nearly a half-century since Malcolm X’s 1965 assassination, he remains controversial. The Nebraska State Historical Society Commission has denied adding him to the Nebraska Hall of Fame despite petition campaigns nominating him. Few schools have curricula about the slain civil rights activist. From its 1971 start MXMF has struggled overcoming the rhetoric around its namesake. The late activist Rowena Moore founded the grassroots nonprofit as a labor of love. She secured the North O lot where the razed Little home stood and where she once lived. Fueled by her dream to build a cultural-community center, MXMF acquired property around the birthplace. The site totals some 11 acres. By the time she passed in 1998 the piecemeal effort had little to show save for a state historical marker. Later, a parking lot, walkway and plaza were added. Other than clearing the land of overgrowth and debris, the property was long on promise and short on fruition, awaiting funds to catch up with vision. Without a building of its own, MXMF events were held alfresco on-site from spring through fall and at rotating venues in the winter. “We felt a little homeless,” says Liwaru. “We were very creative and did a whole lot without a building but we didn’t have a place to showcase and share that.” All those years of making do and staying the course have begun paying off. Hundreds of thousands of dollars in public-private grant monies have been awarded MXMF since 2009. Other support’s come from the Douglas County Visitors Improvement Fund, the Iowa West Foundation, the Sherwood Foundation, the Nebraska Arts Council and the Nebraska Humanities Council. Most notably a $200,000 North Omaha Historical grant allowed MXMF to acquire its first permanent indoor facility, an adjacent former Jehovah’s Witness Kingdom Hall at 3463 Evans Street, in 2010. Now renamed the Malcolm X Center, it hosts everything from lectures, films, plays, community forums, receptions and fundraisers to a weekly Zumba class to a twice monthly social-cultural-history class. Annual Juneteenth and Kwanzaa celebrations occur there. MXMF conducts some longstanding programs, including Camp Akili, a residential summer leadership program for youth ages 14-19, and Harambee African Cultural Organization, an outreach initiative for citizens returning to society from prison. The center is a community gathering spot and bridge to the wider community. Liwaru says it gives the birthsite a “public face” and “front door” it lacked before, thus attracting more visitors. Besides hosting MXMF activities the center’s also used by outside groups. For example, Bannister’s Leadership Academy classes and Sudanese cultural events are held there. A recent site development that’s proved popular is the Shabazz Community Garden, where a summer garden youth program operates. The surge of support is not by accident. The birth site’s pegged as an anchor-magnet in North Omaha Revitalization Village plans and Liwaru says, “We definitely see ourselves as a viable part of it.” North Omaha Development Project director Ed Cochran, Douglas County Commissioner Chris Rodgers and Omaha City Councilman Ben Gray have helped steer resources its way. Since obtaining its own facility, Liwaru says, “I find more people speaking as if our long-range plans are possible.” Those plans call for an amphitheater and a combined conference-cultural center. The all-volunteer organization depends on contributions of time, talent and treasure from rank-and-file supporters. “We believe a little bit of money from a lot of people is beneficial,” says Liwaru. “Sometimes that meant we were probably working harder than the next organization that may be able to go to one or two people to get their funds, but it certainly makes us accountable to more people. We’re ultimately responsible to our community because we have so many community members contribute. In tangible, brick-and-mortar terms, the foundation hasn’t come far in 40 years, but all things considered Liwaru’s pleased where it’s at. However, if MXMF is to become a major attraction a giant leap forward is necessary and Liwaru’s unsure if the support’s there right now. His gut tells him the organization still encounters patriarchal, political barriers. “We always feel we have to come in proving ourselves. I always come in and explain we’re not a terrorist organization or a splinter cell. Most of what we get is a lot of encouragement but it’s a pat on the back and ‘I hope that you guys do really well with that’ versus, ‘I can help.’ I think one of the challenging things is we’re not sure what people think of us. There are many who aren’t sure which Malcolm we’re celebrating. Answers are important as MXMF is S100,000 away from finishing its planning phase and millions away from realizing the site’s full build-out. It could all take years. None of this seems to discourage MXMF stalwarts. Liwaru sees a future when major donors ouside Nebraska help the MXMF site grow into a regional, national, even international mecca for anyone interested in Malcolm X. Besides a House of Loom cover charge, the weekend MXMF events are free. For details, visit www.malcolmxfoundation.org or the foundation’s Facebook page.